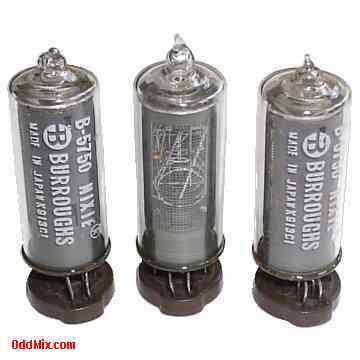 This is an original Burroughs B5750 B5750S B-5750 B-5750S Nixie ultra-long life - 200,000 hrs. - numerical indicator tube, has ten cathodes, numbers 0-9 and two decimal points on either side of the numerals. The tube emits a 200 ft. Lambert bright neon red color at wavelengths of 3650, 4358, 5654 and 5852 Angstroms. The B-5750S is identical to the B-5750 except that its leads are cut to be used in a socket or soldered to a board. The tube's aspect ratio, (height to width) provides for optimum viewing distance and readabilty. Recommended operating voltage is 170 VDCmin, and 2.6 mA typical. These original vintage tubes made in the 1970s for early large scale computers, binary and digital counters equipments and special circuits. Excellent for antique instrument restoration projects or to set up a private tube museum. This is a NOS (New Old Stock) is new (factory fresh), unused condition.